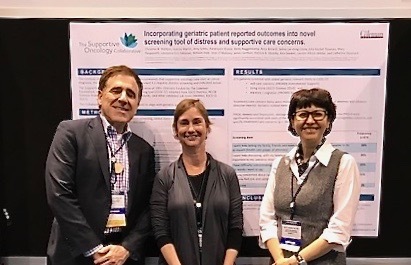 Oncologists who treat elderly patients across cancer types were intrigued to learn about the Supportive Oncology Collaborative’s (SOC) initiative Incorporating geriatric patient-reported outcomes into novel screening tool of distress and supportive care concerns presented June 4 at the American Society of Clinical Oncology (ASCO) Conference in Chicago. The study added four geriatric cancer specific questions to the 35-question SOC screening tool and piloted it with 473 patients across 4 sites. Results Over 1/3 of geriatric cancer patients reported interest in getting help with health care power of attorney and advance directives, and 31% reported self-care concerns. Conclusions: Pilot results and comparison to geriatric guidelines identified important items to support geriatric patient-reported outcomes. After the pilot, we added 3 items for falls/frailty and the screening tool is being implemented across eight sites. The poster was presented as part of the Patient and Survivor Care session where GeriOnc topics are trending. As baby boomers enter old-age, there is a rise in the number of older people with cancer. Recognizing the need for greater and stronger research on the diagnosis and treatment of cancer in older adults and on their survivorship care, this year’s ASCO conference offered new resources and tools such as the SOC geriatric screening tool to conference participants. If you are interested in learning more about the senior -focused supportive oncology screening tool, or participating in the pilot test of the latest version in your clinic, please contact us.